Auto Body Repair Shops. One important contact that you need to have before your wreck. Too often, when you are involved in a wreck, the panic or adrenaline kick in and those first few minutes can make a world of difference on how your repair will be handled. What are some characteristics to look for in Auto Body Repair Shops? Experience – How long a shop has been in business will determine how many challenging issues that have solved. Many of these challenges have to do with people, not parts. The people side is car owners, insurance companies, parts vendors etc. Integrity – Do they do what they say they will do. Sometimes they have to break the news that your car will be delayed. Most of those delays have to do with sub-standard parts being approved by an insurance company. Upon inspection, a professional will not allow sub-standard parts to go on a vehicle. Technical Ability – This should be a given. Technicians that do their job professionally is expected. True craftsman that won’t settle for less than the highest quality means that when you get your car back from the shop, you can’t tell that it has been a wreck. Poise – This means “grace under pressure”. 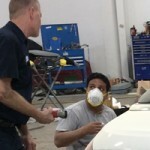 In life and in auto body repair, things go wrong. Dealing with these issues calmly and with compassion and empathy go along way towards customer satisfaction. At Bavarian Body Works, our staff exemplifies these characteristics that you should look for in Auto Body Repair Shops. Keep us in mind when you need this service.